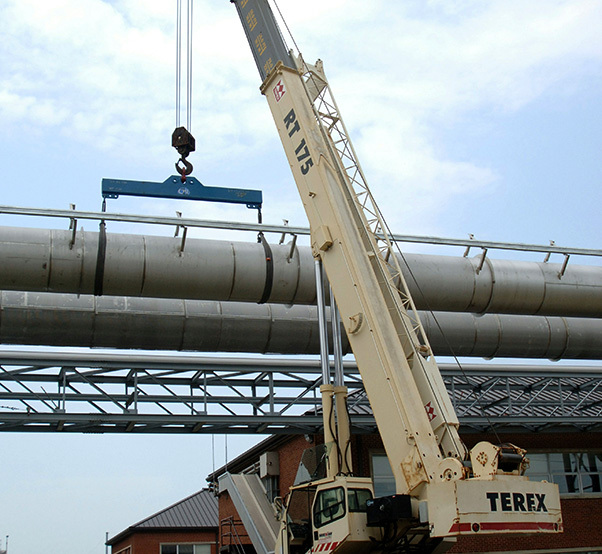 In this 2006 photo the installation of new stainless steel ducting and valves with associated hardware is underway from ETF C-Airside Plant to the J/T/SL test cells as part of the Propulsion Consolidation and Streamlining Program. 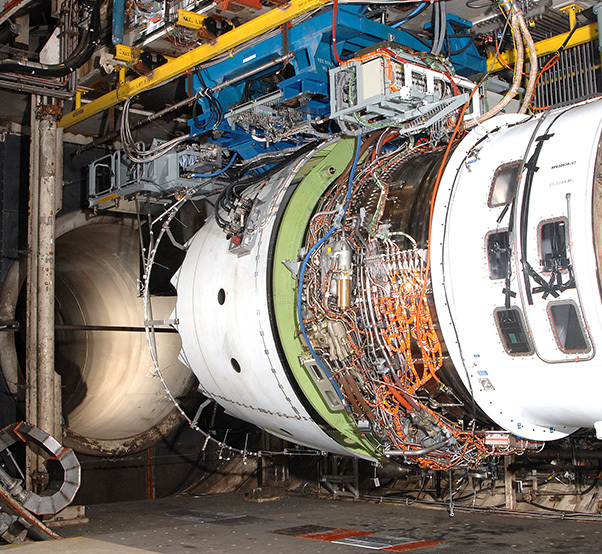 The PC&S Program Phase V, completed in 2007, enabled AEDC to shut down the 1950s-era ETF B-Airside Plant and provide the initial capability for concurrent turbine engine sea level and altitude testing. The 30th anniversary of the Aeropropulsion System Test Facility achieving initial operational capability was Sept. 30, 2015, with the conclusion of a Pratt & Whitney F100 engine test in the facility’s C-1 test cell. Upon conception of the large engine test facility in 1965, ASTF provided propulsion testing for aircraft engines which were “becoming more complex, as illustrated by the J79 engine with variable compressor stators and exhaust nozzles, and the TF30 mixed-flow turbofan engine,” wrote Dr. Jim Mitchell, then the Arnold Engineering Development Complex Chief Scientist, in an 1984 article for the Complex’s High Mach publication. Mitchell also wrote about possible plans for ASTF interconnections with the Engine Test Facility on the air side and exhaust side. Pictured here is a Rolls-Royce Trent 1000 engine prior to testing. The windows on the inlet are used to observe ice build-up on the fan and spinner. 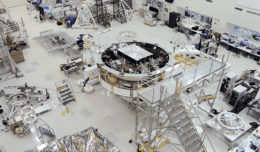 The test was conducted in the C-2 test cell in 2007. Due to upgrades throughout the years, today ASTF provides conditioned altitude test air for the ETF J and T cells as well as the C cells. The sea level test cells also receive test air from ASTF. Air supply tie-ins were completed to those facilities in 2007 eliminating the use of 1939 German equipment in the ETF Air Supply B-plant. A ribbon cutting ceremony in 2012 marked the completion of one of nine project upgrades through the Advanced Large Military Engine Capability program. This project upgrade added “critical test cell cooling capability to the large turbine engine altitude test cells during near sea level testing conditions,” said Rosemary Matty, now retired and the ALMEC program manager in 2012. The C cells are 28 feet in diameter and approximately 45 feet in length. Each cell is capable of testing up to Mach 2.3 and simulating altitudes of up to 75,000 feet. The cells can provide engine inlet temperatures of up to 350 degrees Fahrenheit and accommodate engines producing up to 100,000 pounds of thrust. Since that initial test in 1985, ASTF has tested the Pratt & Whitney F119 engines for the F-22 and F135 engines for the F-35 aircraft. Commercial engine tests have consisted of turbofan engines such as the Rolls Royce Trent 900 and GE and Pratt & Whitney GP7200 for the Airbus A380, the Pratt & Whitney PW6000 for the Airbus A318, the Rolls Royce Trent 1000 for the Boeing 787, the XF7-10 for the Japanese Technical Research and Development Institute P-1 and Rolls Royce BR725 for the Gulfstream G650. 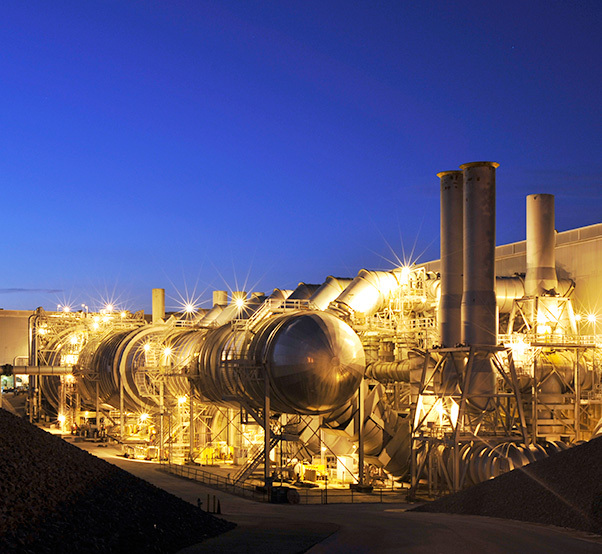 Pictured here is a night view of the Aeropropulsion System Test Facility exhaust side.